Where Are the Female Law Enforcement Officers? A plethora of descriptions and opinions may immediately come to mind. But the research and data makes something very clear regarding public safety policy, policing performance and female representation in law enforcement. According to the most recent Bureau of Justice Statistics census of state and local police departments, only 11.9 percent of police officers in America are women. Although this represents a continuing increase –up from only 7.6 percent in 1987- the data show that most of this progress is centered in larger agencies in cities with 250,000 residents or more. In every category of population size, female police representation decreases proportional to population. Why? 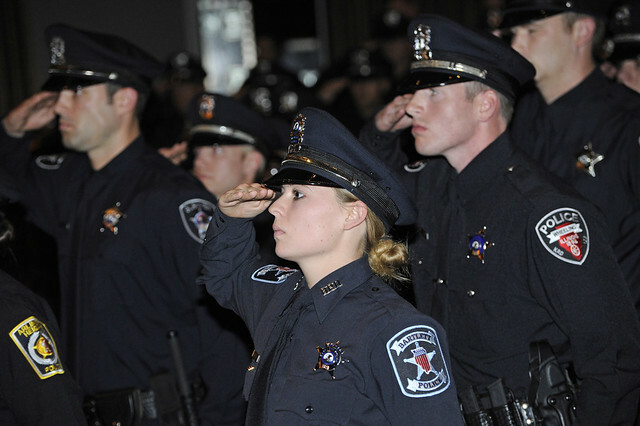 Research compiled by the National Center for Women in Policing has consistently shown that women are just “as competent as their male counterparts,” rank higher in evaluations of community oriented policing values, register fewer complaints and instances of using excessive force, and provide perspective that management can utilize to improve organizational culture and policies related to family leave time, recruitment and training. So what accounts for such a small percentage of females in policing? Both of these officers agreed that there are too few female role models in policing and suggested more female officers should be included at recruiting events and high school career days to “give women the belief and hope that they can actually obtain these positions someday.” Both observed that women were conspicuously absent from recipient lists at awards and honor ceremonies. Unfortunately, women are still staggeringly underrepresented in supervisory and top command positions. This may be due to residual stereotypes that hold females as less capable of handling high-stress, high-ranking positions. There are circumstances in law enforcement that require the unique skills sets of both men and women, but without assignment predetermined exclusively by gender. In sexual assault cases, for example, some victims prefer a male officer to assist them while others may prefer a female officer. This deconstructs the notion that police work requires gender-specific responses and suggests that diverse policing practices serve the needs of the widest spectrum of individuals possible through an understanding of their various values, beliefs, cultures, norms and needs as dictated by the individual citizens and on a case-by-case basis. When we consider the ever-increasing demands on public safety policy to meet the expanding needs of multicultural values, perhaps foci of diversity should place an emphasis on providing the widest, most diverse range of services? The data and experience demonstrates that women police officers are not only capable, but excel at providing this definition of diversity. Sometime later, the officer formerly known as “Pockets” encountered her former captain. He said his decision to request the withdrawal of her K-9 application was “still haunting” him. When she inquired further, he revealed that he had a daughter currently attempting to start a career in law enforcement. Author: Donal Hardin is a retired policing and corrections professional currently pursuing his Ph.D. in Public Policy and Administration. Specializing in public safety ethics, Donal teaches criminal justice courses at various institutions of higher learning. Donal can be reached at [email protected].